Here is the photo of the CQed RR block I did for the Spring is Sprung CQed RR I'm in.. these are of Helina's block.. A challenge for me as my repertoire of flower making in stitches isn't as large as I'd like it to be. I do hope that Helina likes it none the less. 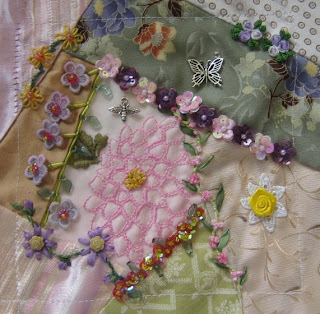 It is lovely -- I have never done the large pink flower pattern. Must try it. I think you did a great job! by the way, welcome to Cdnquiltswappers! It is a great group and you will enjoy swapping with the girls.